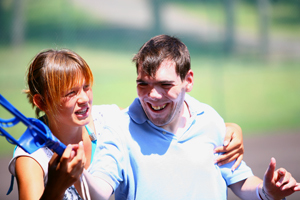 A special needs residential camp for children and adults. Creating lifelong memories and making a difference in the lives of individuals with developmental disabilities since 1975. Do you want to have the summer of a lifetime? If flipping burgers or sweeping floors is not your ideal way to spend a summer, then consider joining our staff of young people from around the world- and make a difference in the lives of the special campers we serve. You need to be willing to work hard, be committed to your job, and display a sense of humor at all times. We provide a thorough training period, and will always be there to assist you. All positions require staff members to assist campers with personal care, which may include toileting, dressing, and showering. Lifeguards are responsible for supervising our swimming and boating programs in our beautiful 2 acre lake. Lifeguards are also assigned to assist cabins. Program specialists plan and supervise our activity areas including music, arts & crafts, dance and movement, sports and games, and nature. Specialists are also assigned to assist cabins. We hire both RN’s and LPN’s to take care of medications and the health needs of our campers and staff. Live and work in a beautiful infirmary. We utilize the services of a local consulting physician. be an active part of our camp family, and assist in the areas of kitchen, laundry or maintenance.